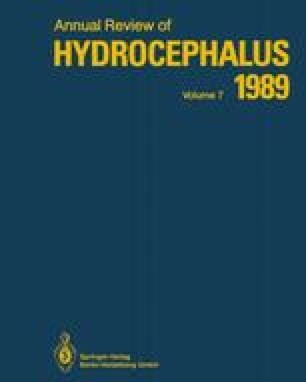 Experimental hydrocephalus was produced by intracisternal injection of kaolin in 8-week-old rats, and body weight was measured consecutively (3, 5, 7, 9 days and 2, 3, 4, 5 weeks following the injection). These hydrocephalic rats were divided into three groups, i. e. mild, moderate and severe hydrocephalus on the basis of the changes of body weight and ventriculomegaly. The intraventricular pressure (IVP) was measured by stereotaxic puncture of the right lateral ventricle. After decapitation, lipids were extracted from the specimens taken from the frontal and parietal lobes. Phospholipids, cholesterol and fatty acids were quantitatively analysed by thin layer chromatography (TCL) and gas chromatography (GC), and thiobarbituric reactive substance (TBA-RS) was measured by the method of Yagi et al. The changes in body weight correlated with the degree of ventricular enlargement. Increase in IVP also correlated with the severity of hydrocephalus. Although the peak increment of IVP preceeded the development of ventricular dilatation for 3 to 7 days, the higher the IVP in the acute stage the larger the ventricles was observed. On the other hand, IVP fell in the chronic stage of the group of severe hydrocephalus in spite of a tendency to ventricular enlargement persisted.